Volunteer with children in need as you also experience a beautiful corner of Mexico. Sadly, over 40% of the population of Mexico lives in poverty. That also means children too. Your role as a volunteer will be to support disadvantaged children and the grassroots organizations that help them. This project is an excellent opportunity for those who want to volunteer with children in Mexico. You will see the resilient heart of a child flourish everyday. Although it may be difficult to witness some of the challenges these children face, you will also feel the rewards of being part of their support system and hope. No skills are required to volunteer in orphanages in Mexico, only the passion to help orphaned children. If you understand Spanish you will be able to communicate better with the children and help them more. If you do not speak Spanish, you can talk classes while volunteering. Alternatively, you can learn few words before coming to volunteer. You must also respect the local culture and customs of Mexico during the project. 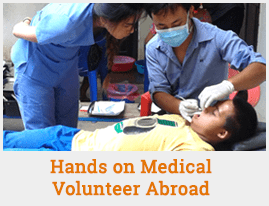 Mexico enjoys hot and humid weather all around, so volunteers must adapt to the heat. As a volunteer in orphanages in Mexico, you will contribute in the development and growth of young orphaned children. You will help the local staff as they work with children and directly involve them in various skill-developing activities and teaching English. Your commendable effort, contribution, teaching, love, care and inspiration for these underprivileged children will definitely enhance their knowledge, skill, perception, and experience thereby assisting to make their future successful and radiant. You can also work in gardening and your duties may include, but are not limited to: teaching gardening classes, caring for livestock, supervising both children and adults, and helping with training events. This project is located in mid-sized city of Manzanillo in the Colima region. Colima is a small state located in the western part of Mexico on the Pacific Coast. Even though Manzanillo is not a huge city, it is one of Mexico’s largest on the Pacific side of the country and there is plenty to do. Manzanillo is famous for its delightful beaches and vibrant port. The area has significant historical prowess that dates back to the time of Cortez in the 1500’s. Volunteers can spend their free time exploring the city and the nearby natural habitats. There are many restaurants throughout the city that host excellent seafood. The city is known as the sailfish capital of the entire region and host two highly acclaimed fishing tournaments every year. Manzanillo also has a lively nightlife. For those whom are golf enthusiasts, Manzanillo rivals the courses of Cabo as a golfers paradise. There are also the cities of Barra de Navidad and Melaque nearby which volunteers are welcome to explore.